I visited an old college friend who lives just outside of New Haven, Connecticut from Sunday morning to Wednesday morning. We decided to give my visit a particularly girly feel. On Sunday, I took a very early train in order to arrive in time for the polo match. We still had some time to kill for the game though, so we ate at a small local place in her suburb where everyone seemed to know one another. My friend is currently living on a horse farm which hosted the event. This was my very first polo game and my chance to learn about it. I even stomped the divets, which I already knew about from Pretty Woman. After that, we ate at a local Tex-Mex restaurant, the spot to go. The margarita and the meal were both delicious ...and it was kinda funny that the service was truly horrible! Our reservations were lost and that was only the beginning! Luckily, we were listening to live music. And I was dressed in my cute little sundress and wedge sandals. And out with my fun friend F! We started the next day with breakfast at a local diner. Chocolate chip pancakes for me! 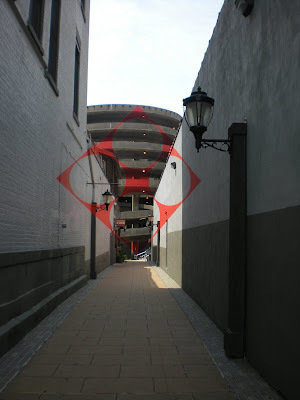 Next, we explored downtown New Haven, which is kinda small but very nice. At the center is a "green." Mainly on Chapel Street, we shopped for accessories. Most notable of which was my friend's really cute clutch which was actually recycled from old vinyl diner seats by a local artisan. It is truly fabulous, style with a story. 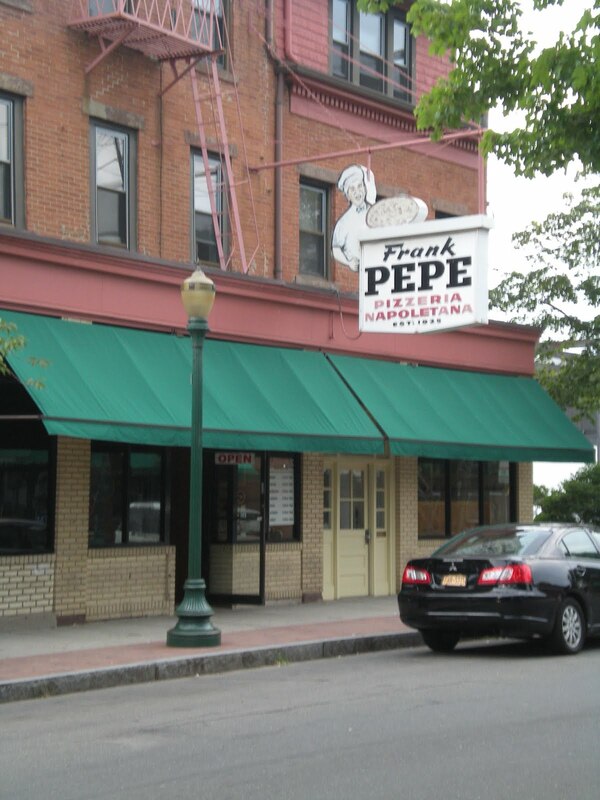 We dined at Frank Pepe's for New Haven-style pizza, this is a wood fired thin crust pizza with quality ingredients. We tried the summer version of the original which was a thin crust bottom with a thick crust around the edge that was browned to different shades. It had mozzarella, basil and garlic on it with fresh tomatoes on top. We decided to try the original next time; we're thinking it has tomato sauce. When you have friends visit, you get to discover your own backyard. Anyway, it was delicious. I wish I had my own pictures of the pizza but I totally slacked, again. ﻿This is actually an art installation in New Haven. and when you stand in the spot I am, a diamond with four circles appears. On Tuesday, we hit the beach, a private one where we had to know someone. It was beautiful, the beach was surrounded by quintessential New England houses. You know the ones covered with the dark brown shingles you see in the Hamptons on TV shows and in movies. We packed farmer's market goods for a dirt cheap yet delicious lunch. I flipped through F's Real Simple while hoping to get a bit more of a tan. Next, we went shopping for shoes, makeup and stuff for my new apartment later that afternoon. For dinner that evening, I tried steamed cheeseburgers which was the thing there. I wasn't very impressed with the overly juicy and thus drippy burgers. My family and I happen to be huge fans of the grill. We sat on the porch to eat. We did a lot of porch-sitting, with a cold beer to beat the heat. It was nice as we were surrounded by mountains, plus many people stopped by to chat. We enjoyed our fourth cup of ice cream over the course of the 72 hours I visited that evening. Homemade ice cream which was fantastic. I teased my friend that my trips to Italy are usually punctuated by gelato! On the way to the train station to depart, we had breakfast at the best Panera I've ever patronized. The pastries looked wonderful when they were actually browned! My cappuccino was also very well made. The five hour train ride was very long again. And then I couldn't even go home because my parents were redoing their floors. So a friend and I went to go get pedicures. My first professional pedicure ever. I loved it. My toes look really good! I stayed the night over a friend's, kinda extending my vacation. We did a lot but it was so great to simply hang out with this old college friend of mine. Since she graduated in May 2006, I've seen her for a couple of days at my December graduation and at two weddings of our mutual friends. ...but those events made us busy and this trip was full of truly quality time. I also saw what she's told me all about in this chapter in her life.